Dimensions 1.25 by 8 by 10 in. 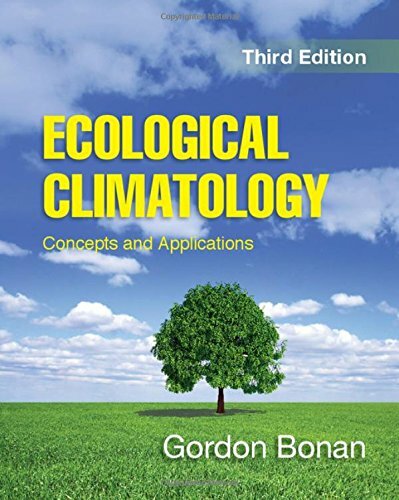 Amazon.com description: Product Description: The third edition of Gordon Bonan's comprehensive textbook introduces an interdisciplinary framework to understand the interaction between terrestrial ecosystems and climate change. Ideal for advanced undergraduate and graduate students studying ecology, environmental science, atmospheric science, and geography, it reviews basic meteorological, hydrological, and ecological concepts to examine the physical, chemical, and biological processes by which terrestrial ecosystems affect and are affected by climate. This new edition has been thoroughly updated with new science and references. The scope has been expanded beyond its initial focus on energy, water, and carbon to include reactive gases and aerosols in the atmosphere. The new edition emphasizes the Earth as a system, recognizing interconnections among the planet's physical, chemical, biological, and socioeconomic components, and emphasizing global environmental sustainability. Each chapter contains chapter summaries and review questions, and with over 400 illustrations, including many in color, this textbook will once again be an essential student guide. About: The third edition of Gordon Bonan's comprehensive textbook introduces an interdisciplinary framework to understand the interaction between terrestrial ecosystems and climate change.